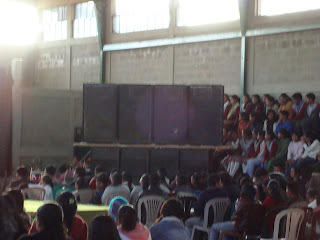 I’m sure in my last two years of blog posts, that I have mentioned the Guatemalans’ love of loud noise somewhere. Its amazing the level of sound they can tolerate, and that there aren’t more deaf elderly. I just left the election of Señorita Flor de La Feria and am now suffering from a major migraine. To drive the point home, please check out the speaker set they deemed necessary for use in a regular sized gym. I was vibrating the entire event, and not as a result of my cell phone. Wouldn’t want the neighboring towns to miss out. I don’t doubt they could hear it… sound travels better here, across valleys to neighboring ridges, and forget sound barriers: no insulation.